One of Northern Wisconsin's Year-Round Best! The Butternut area can claim some of the best fishing in Wisconsin. One of the best lakes in the area is Butternut Lake, about 1 1/2 miles off of Hwy. 13 on County Hwy. B, just 5 miles north of Park Falls. Enter Park Falls fishing guide and owner of Bridge Bait (bait, tackle, guide service, rentals and repairs), Tim Doughty. Tim fishes the entire area, and claims that if there's a better year-round fishing lake than Butternut Lake, he hasn't found it. Butternut Lake is glacial in origin and stream fed by Butternut Creek. Maximum depth is 32 feet. Average depth 12 feet. Bottom runs the whole gamut: Marsh, sand, rock, weeds, with some pretty sharp breaks. There is some residential development, but lots of open shoreline. Two public boat landings. The better of the two, the one at Highway B, has a pier. There's one large island in the lake, with an inhabited cabin on it. There are many bays and inlets. Water is fairly dark, with little algae growth. Locals say it is a very clean, excellent swimming lake. Perch run 8 to 10 inches; and there are few bluegill. According to Tim Doughty, almost all the anglers who regularly fish Butternut Lake practice 99% catch-and-release of ALL species. "Look, it's a great resource," he says. "Those of us who prize the fishing on Butternut want to keep it that way. For me, that means releasing any walleye bigger than 18 inches, or retaining only the panfish I can eat right-then. Almost every musky is released. "And, don't forget," he adds, "any fish, no matter how big will fit in a picture. So use your camera, and retain a photo memory. Return the fish, and let it grow and reproduce for the future." In the spring on Butternut Lake, walleye hold pretty close off their spawning reefs in a little deeper water, and the usual bait of choice is large fatheads in the colder water -- 2 to 2 1/2 inches or so -- with leeches and crawlers coming right behind, depending if the water temperature rises a bit. Doughty says to use floating or leadhead jigs, and also slipbobbers. Fish the drop-offs and points in 8 to 15 feet of water, and FISH SLOW in the early spring, because the water is pretty cold. An area called "The Narrows" is excellent for early spring fishing, according to Doughty. Located right in the middle of the lake (the lake is 3 miles long, and about a mile wide at its widest point), it is the narrowest point of the lake. It's also the deepest, and there's a current that runs through it, and along the two sandbars and their points that are right there, and from which there are sharp drop-offs. Fish that area all day in the spring. Try different baits to determine what's working best. Anglers should not be surprised to get some great northern and musky action while fishing for walleye (remember that Wisconsin's musky season does not open until late May, so you should immediately release any musky you might lock into before that date). Forget about crappie, perch and bluegill at this time. "You might get a little blue around the edges from the cooler weather," Doughty smiles, "but the fishing action is tremendous in the spring." "Musky Hunters" will happily note that spring musky fishing is excellent right after the season opens around Memorial Day. According to Doughty, smaller is better when it comes to lures and spring musky fishing. Use bucktails, spinner baits and small surface or crankbaits. Fish the shallower water in the warmer, shallow bays. Early morning or late afternoon on cloudy days is best. Spring crappie will also start hitting hard around this time. They love the warmer, shallower waters over rocks and sand, and in weedy bays, where the crappie go to spawn. Fish anywhere from 3 to 8 feet of water using minnows. Look particularly for brushy shorelines, which may harbor crappies packed in like cordwood. "Summertime -- and the living is easy... " goes the famous ballad. On Butternut Lake, the fish feel the same. For walleye, go to leeches on leadhead jigs during the day, in 8 to 15 feet of water, adjacent to sharp structure off of shallow weed flats. Evening walleye fishing can be a gas if you know where to fish, says Doughty. Comfort range for walleye is 65 to 75 degree water temperature, and in the evening you will find them up as shallow as 18 inches. Techniques are slip bobbering with leeches laid down in the weeds, or floating Rapalas - - fish the Rapalas slowly on the surface in very shallow water, or you can drop a leadhead jig in the weeds with a big crawler. You'll get action. Northern turn off in the summer on Butternut, so don't be disappointed if you don't catch them. They're there, and they'll return when it gets close to ice-in. Summer musky fishing can be excellent, too. Go to larger bucktails, crankbaits and surface baits, and fish musky ALL DAY on the edges of weedlines and also over deeper water, because many of Butternut's summer musky suspend. Crappie action gets as hot as the weather, with the fish going back into deeper water and suspending. Fish 15 to 25 feet over the MANY cribs in Butternut, says Doughty, where the crappies are suspended 8 to 12 feet over the cribs. Use minnows and spinner jigs. Smallies like the cribs, too -- but they're around, not on top of them. Look for smallies as well, along weedline edges. Use crankbaits, spinner baits or crawlers. Doughty says you'll start getting some nice perch action in the weeds or just outside weedlines, using crawlers, leeches and small minnows. And you'll often catch perch while fishing for walleye as well. Doughty says perch can be very finicky, so you may have to change baits until you find the one that the perch want on that particular day. The nice thing about Butternut perch is that they're clean and firm. The cleanliness and excellent maintenance of the lake make for very healthy fish. Walleye are on the flats adjacent to drop-offs, in 8 to 12 feet of water. Leech and crawler action drops off rapidly as the water cools, and savvy anglers start using bigger minnows as the primary bait. Northern action is still usually slow, although you will start picking up some northern while fishing for walleye. Smallie action is nothing. Crappie will start moving over the shallower cribs and into the shallower waters. Use crappie minnows or hair jigs, just fished under a bobber. And now, it's "Heeeere's musky!" "Start using large jerk and crankbaits, but fish real slow," says Doughty. "Start to go deeper than in the summer pattern. Musky will be found in 7 to 15 feet of water, but they SUSPEND from about 5 feet and downward. They will come up as far as ten feet or more to hit a lure, so try different depths." You can fish all day and all night, and, if there's a full moon -- WOW! Locals swear that anyone can catch a Butternut musky under full moon. By the way, Butternut is notorious for catching big musky on large suckers, up until ice in. Note: The larger suckers won't get as many musky as the larger jerk and crankbaits, but they will help you land a bigger fish. One rule of thumb that all anglers should remember well: When fishing suspended fish, be they crappie or musky, or any other species, remember fish will feed/bite UPWARD, never downward. Don't expect some big slab crappie to follow a bait downward, but it will follow and hit a tasty minnow that it can see overhead. Forget perch to a great extent at this time of year. You might get an occasional big bluegill while fishing for crappie, but don't count on it. Bluegills aren't much in Butternut, at any time. Early ice in the bays spells some of the best walleye fishing of the year on Butternut Lake. Fish anywhere from 5 to 12 feet of water, with the baits of choice being medium suckers or larger golden shiners. Nice action. Northern really turn on in early ice on Butternut Lake. Many say the best of the year. Inexplicable, but it seems to happen every year, according to Doughty. Use the same action and baits as for walleye. Midwinter walleye slow down, but northern action stays active. As winter wanes, walleye pick up again, until the season closes, especially during daylight hours, and you'll get some bigger walleyes. Use medium suckers for best late season walleye action. Doughty says you'll start getting perch around midwinter, jigging with both minnows and waxies. A little crappie action, but crappie really turn on late in the season, and they're deep. Anywhere from 12 to 25 feet. Use minnows or waxies. That's the "skinny" on Butternut Lake at Butternut. A first-class fishery. Well maintained, with only moderate pressure on the resource because of the ongoing policy of anglers to catch-and-release almost everything of every species they hook into. Oh sure -- nothing better than a firm, slab crappie through the ice. The taste is fantastic. 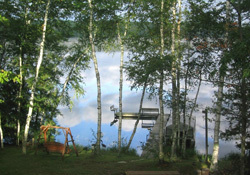 But keep only what you can use, and come back often to one of northern Wisconsin's best -- Butternut Lake. For more information, contact Tim Doughty at Bridge Bait, 1414 4th Avenue South, Park Falls, Wisconsin 54552; phone 715-762-4108. Naomi K. Shapiro is a member of the Outdoor Writers Association of America (OWAA), Wisconsin Outdoor Communicators, and a professional publicist. She is architect of the award-winning Northern Wisconsin / Northwoods Tourism, Travel & Outdoor Information Network Online (http://www. northernwisconsin.com), with current weekly fishing and outdoor reports and information for several northwoods areas and northwest Ontario. She can be reached at Box 32, Clam Lake, Wis. 54517; phone = 715-794-2186; e-mail = cre8vads@win.bright.net.